After the long-term troop planning meeting, estimates the funds required to support the planned activities and ensure that there are sufficient fundraiser’s to fund them. Estimated costs and income are determined from records of past experiences. Attends activity planning sessions so that they have a good understanding of the scope of the anticipated event. Utilizes Troop Ledge software to track all expenses and income. Reconciles the balances in Troop Ledger with the corresponding bank statements. On a monthly basis supply troop committee with a detailed accounting of the previous months transactions and the current account balances. Compare current balances with future activities to ensure that they are adequately funded. Evaluate expenses for troop activities. Make recommendations to the committee for reducing expenses. Track deposits to a Scouts account and inform them of their balances on a semi-annual basis. Any expenditure from their account needs to be approved by the Scoutmaster. Participate in annual inventory of the troop’s equipment and compute equipment replacement cost. Update Troop Ledger for modified equipment values. Attend as many troop meetings as possible, especially on the nights that camp fees are due to be collected. Coordinates annual troop charter submission with committee chair, chartered organization rep and Scoutmaster. Acts as liaison for new scout parents, which includes: providing welcome packets, providing a troop orientation, distributing and collecting leader application forms, obtaining committee chair and charter organization rep. signatures and submitting to council, collecting and maintaining troop resource surveys from parents. Coordinate publication of troop policy manual. Monitors training and adherence to youth protection policy. Keep active track of Scout/leader medical forms – track down parents, collect updated forms, make appropriate copies, update book and spreadsheet, archive expired medical forms. Hand off medical binder to Trip Captain for each outing. Make proposals on Troop equipment we should acquire and justify its value/ utility. In absence of an Equipment Coordinator the duties of this role are shared by the Treasurer & Scoutmaster – and are typically assigned to volunteers. Oversees and ensure scout advancement. Eagle Scout Court of Honor Tasks. Discuss with the parents the tasks that they and the troop must perform. See FAQ “I FINALLY reached Eagle, now what do I do?” for a complete list. 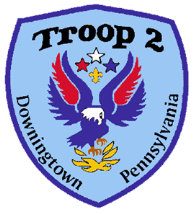 When a scout completes a rank requirement or merit badge they ask the Advancement Record Keeper to enter the information into the troop database. The troop uses the software program TroopMaster to maintain it’s records. The TroopMaster database is stored on the Internet so that other Troop 2 leaders can access the records. The database is encrypted to ensure privacy. The record keeper must attend the majority of the troop meetings. Normally, the record keeper downloads the database to a laptop computer and brings it to a troop meeting. After the troop meeting, the updated records are uploaded to Internet database. When a scout asks for a requirment to be entered into the database, the record keeper should check that the date of completion and the initials of the person that verified the requirement appear in the Scout’s handbook. Solicit the records from service projects and record them in the database. Administers and arranges for outdoor trips. Meet with Scouts and adult leaders at long range planning PLC in order to get the troop input for trips desired, available dates and any special accommodations and/or reservations, which will need to be made. The long range planning PLC usually convenes twice per year in late Fall and Spring to brainstorm on the upcoming year’s program. Identify Boy Scout Camps, state parks, county parks and private campgrounds (in that preferred order) that would be in close proximity to the activity the troop would like to pursue. Contact the sites and make the reservations 3 to 4 months in advance. Secure pricing and make necessary arrangements for any activity that is associated with a camping trip, i.e. skiing, canoeing, orienteering, rock climbing, etc. Maintain a list of all driver’s car information, insurance information and seating capacity in Troop Master. This information should be included in the filing of the Tour Permit with council. Coordinate with the Trip Captain to make sure that driving directions to both the campsite and activity site a printed. Secure the permission of council for trips. the Tour Permit needs to be filed with council and approved prior to taking the trip. Approved Tour Permit must accompany the troop for any trip. Create a permission slip for the Scouts to fill out a least 5 weeks prior to a trip. Permission slip describes the trip and details costs for the trip, including food and activity, any special equipment needed and an emergency contact phone number. Collect permission slips and monies at Thursday meetings. Disburse food money to patrols 2 weeks before the trip. Create a roster of Scouts and adults for a trip. Make sure any special requirements or activities are coordinated. Prepare a trip package, which includes approved Tour Permit, trip roster and driving directions, signed permission slips and any checks needed for final payment. This should be distributed to the trip captain the Thursday meeting before the trip. Turn in post trip roster to ASM in charge of the troop database or those attending, how many nights and whether tent or lodge camping. Update the committee at regular monthly committee meetings on the status of recent trips as well as upcoming trips. The report should include numbers of Scouts and adults attending, any issues or problems and final tally of costs. Prepare an annual outdoor budget for the troop. Costs should consider camping fees, troop subsidy for any special trips and equipment/transportation rental if applicable. Attend summer camp planning meetings. Prepare and distribute packet of information Scouts/parents. Announce trip at troop meetings and distribute permission slips. Collect money and permission slips. Enter activity attendance information into Troop Master. Provide a roster to SPL and Trip Captain. Provide directions to Trip Captain. Provide Tour Permit to Trip Captain. After the trip give the collected money to the treasurer. Local Tour Permit Must be filed by trip captain before a trip. NOTE: It is usually easier to use Troop Master .DotNet to create the permit. How to obtain proof of insurance A request for proof of insurance must be sent to Bob Hinderliter at council. His number is 610-696-2900 Ext. 10 and his email is rhinderl@bsamail.org. He will need the complete address of the camp and camping dates. Email the information to him and then give him a call. He can either fax the insurance form to you or you can pick it up an council. Historic Trails/50-Miler Program Opportunity for Scouts to earn a special award. Ensures troop leaders and committee members have opportunities for training. Work with the district training team in scheduling Fast Start training for all new leaders. Assist in orientation of new parents. Serves as liaison between the chartered organization and the troop. The chartered organization representative must be a member of the chartered organization. Obtains and schedules meeting space for troop meetings, events and committee meetings. Keeps the head of the chartered organization informed of troop activities. Invites the chartered organization head to troop events. Secures a troop committee chairperson and maintains a close liaison with the chairperson. Recruits new adult leaders and approves adult applications. Assist in annual troop re-chartering. Organizes the committee to ensure all functions are delegated, coordinated and completed for a quality program. Convenes and presides over a monthly Troop Committee Meeting. Prepare a Committee Meeting Agenda. Approve meeting minutes for as needed distribution. Recruit new members; approve adult applications. Address issues/recommendations raised by Scoutmaster. Assist Scoutmaster in recruiting/placing parents into ASM or Committee positions. Ensure adherence to documented policies. Support Scoutmaster with “problem” and special needs Scouts. Work closely with Charter Organization Rep. Ensure the scheduling of facilities at the Charter Org. for Troop Meetings and special functions. Support the Charter Rep in the implementation of Charter Org. mandated policies (i.e. Safe Environment Policy). Meet with head of Charter Organization at least once per year, with the Charter Rep. to inform Charter Org. Head of Troop progress. Ensure Troop participation at Roundtable sessions. Prepare and submit the Troop Charter in a timely manner. Communicate needed information to parents.